Michael Jones is a qualified solicitor, who is now a Parliamentary Assistant to the former Labour Cabinet Minister, John Denham MP. 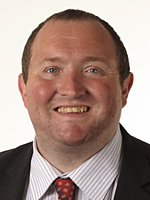 In 2013 Michael returned as a county councillor after an eight year gap, and represents the division covering the town centre area of Crawley. Michael is also a borough councillor for Crawley and has been a long-standing campaigner on local issues across West Sussex. Michael is a member of the union Unite, the Society of Labour Lawyers and the Co-operative Party. A strong believer in the co-operative movement, he is currently Chair of the West Sussex Co-operative Party. He also supports Southgate Community Forum, Talk Bewbush and the Bewbush Action Group through his work as a councillor. Michael's interests include reading, coastal walks and classic television.